Teamwear Ireland can deliver orders to the UK, Ireland & beyond. All items are ordered to your specifications and our standard dispatch times are 10-14 working days from date of order. Decorated or personalised items requiring numbers, printing, embroidery etc will take longer - this includes garments with a club crest. We would aim to dispatch these items within 15-20 working days from date of order (3-4 weeks). However, in exceptional circumstances this can increase due to the complexity or quantity of your order. Delivery times for decorated or personalised items are dependent upon your supply to us of correct artwork & graphic files required to set up and/or apply to your garment. Our trained sales staff will contact you to discuss your decoration needs & advise what is required. We will advise you by e-mail of any delays or issues with your order. 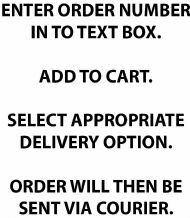 For peace of mind, all our web orders to UK & Ireland are dispatched via courier and usually arrive within 1-2 days from dispatch. This allows us to track & trace your order after dispatch and also provides insurance cover for any rare occasions that an order may get lost or damaged in transit. Any dates quoted for delivery of your order are approximate only and we shall not be liable for any delay in delivery of the items howsoever caused. Time for delivery shall not be a term of the contract with Teamwear Ireland unless previously agreed in writing by us. We can deliver to an address other than your registered credit card address. However, if it is your first order, the parcel will be delivered to the registered cardholders billing address, thereafter an alternative address can be chosen. We do not deliver to a PO Box address for security purposes. If you instruct us to deliver to your work address, you will need to be confident that someone will be there to take receipt of the goods as the courier will deliver to the place not the person. For Customers in Non EU countries Customs or import duties are applied once the package reaches its destination country. All additional charges for customs clearance must be paid by the recipient (including, but not limited to, taxes, duties, holding fees). We have no control over these charges and cannot predict what they may be. Customs policies vary widely from country to country and are subject to change so we would advise you to contact your local customs office for current, up to date information prior to placing your order. We will also not be liable for any further costs incurred as a result of a recipient's refusal to pay customs charges and will charge accordingly for any charges incurred by Teamwear Ireland as a result of the recipient's refusal to pay the applicable charge levied by Customs.